Are you comparing to buy a sofa bed?This beautiful sofa bed is a luxurious option for you and your guest bed needs. · Converted from Sofa to Bed in seconds. · Luxurious Faux Suede or Linen Finish,UK fire regulated. SUPER HIT! XL BED SIZE SOFA BED 'MARY' SILVER FAUX SUEDE ! MOWIMY PO POLSKU! SOFA BED MARIA FEATURES MODERN LOOK AND THE LARGEST POSSIBLE SLEEPING AREA Sofa unfolds easily in seconds. SOFA MARY laczy nowoczesny lekki wyglad z funkcjonalnoscia. ALL SOFAS COMPLY WITH FIRE AND SAFETY REGULATIONS. Condition is Used. Collection in person only. from smoke and pet free house. Chaise Longue Weight 31Kg. 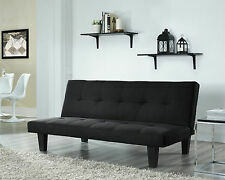 ThisElegant Sofa Bed oozes class & sophistication. Made from the finest brown faux Suede leather fabric material it is a real showcase for any room of the house. It's purposely designed to give a Victorian Antique feel & looks stunning in houses both old & new. 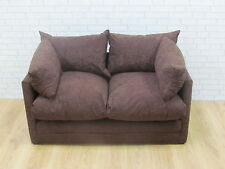 The faux suede finish gives you a luxury, soft sitting and sleeping space for anyone to enjoy. under sofa clearance / leg height - 20cm. Turns from a sofa to a bed in just seconds. luxurious faux suede finish.